Sister Adrienne Bradley, a beloved Sister of Saint Joseph of Philadelphia for sixty years, died on October 6, 2018 at Saint Joseph Villa, Flourtown Pennsylvania. The Mass of Christian Burial was celebrated at the Villa on October 11, 2018. Adrienne was born in Shamokin, Pennsylvania, the only daughter of her parents’ six children. They moved to Philadelphia where she attended Our Lady of Mount Carmel elementary school and John W. Hallahan High School. At a young age Adrienne and her brothers were separated and placed in foster care. This was a heavy cross because she loved her family, but she was forever grateful for the good home she received with the Robinson family. Adrienne cherished her relationship with her foster sister, Margaret. During her high school years Adrienne was drawn to Jesus. Her practice of daily Communion gave her inner strength and resilience. In 1958 she entered the Sisters of Saint Joseph and received the religious name Sister Martin Denise. 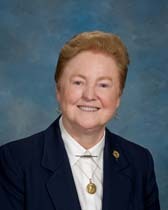 In her early years as a Sisters of Saint Joseph, Adrienne received her degrees in Elementary Education from Chestnut Hill College and Shippensburg State College. She served as an elementary school teacher and principal. She was known as an excellent teacher, a master teacher who served as a resource for other educators. In the early 1990’s Adrienne’s journey brought her to Saint Anastasia Parish in Teaneck, New Jersey where she served for the past twenty-five years as Director of Religious Education and Faith Formation. She responded to the needs in every area of parish life. Sister Adrienne was involved not only in Religious Education, but also in social justice, RCIA, spirituality, retreat days and bereavement. She studied at many different colleges so that she would be professionally qualified to meet the needs of others. She reached out with loving care and joy to all. On one occasion the pastor asked her to “do whatever we can to bring the people together.” Adrienne’s response started with pizza suppers and coffee conversations, and extended far beyond. She was well-respected in professional circles, serving on the executive committee of the National Association of Parish Catechetical Directors, and she was also involved at the Archdiocesan level. As Adrienne found nourishment in the Eucharist and her relationship with Jesus in her younger days, her trust in God’s understanding and love gave her strength to go on in peace during the suffering of her final days.